I recently bought a poetry pamphlet dating from 1908, from the extraordinary treasure trove that is NeverSeen Books & Curios. It’s an eight-page booklet, published in Hull, number 15 in a series issued by George Gresswell, ‘The Engine-driver Poet’, more of whom below. There are five poems, two of them by Bingley Wilson, three by Gresswell, and two of the poems (one from each poet) are on the same subject: ‘The Barnsley Disaster’. They left their father’s door. And would not if we could. And put their hair in curls. And some were only four. Began to push or pull. Were killed amid the crush. In a coffin, ‘neath a shroud. Death dost but life begin. 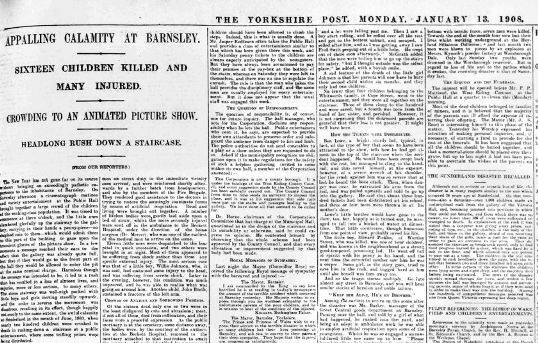 The Barnsley disaster took place 11 January 1908 at the town’s Public Hall, at a film show organised by touring entertainment company the World’s Animated Picture Company, managed by James Atroy. The company had had a residency at the Hall all that week, and had organised a children’s matinée for the Saturday, with seats specially priced at threepence, twopence or a penny. The Hall had a ground floor pit and stalls, a horseshoe-shaped balcony, and above that a gallery with barrier. The gallery had a separate entrance, and it was where the children with only a penny all went. Five hundred or more had squeezed into the gallery space – the Hall had space for 1,500 people overall, but it was common at this time for children to be packed in three to every two seats. With the gallery full and hundreds of children pressing to enter, an attendant directed them to turn back down the stairwell and to enter the ground floor space. This caused a stampede, with the children returning meeting the children trying to ascend. In the resultant crush sixteen children died, with ages between four and nine, and over forty more were injured. Many pathetic scenes were witnessed both in the yard adjoining the hall and at the hospital. A large crowd quickly gathered round the gates of the institution, among them scores of anxious parents who only an hour ago or so previously had dressed up their little ones in their best clothes, and sent them in the highest glee to the Public Hall. Their sorrow on learning that the lives of their loved ones had been taken away in such a tragic and sudden manner was pathetic in the extreme; while almost as touching was the sight of parents weeping for joy when it became known that their children has escaped injury. Throughout the afternoon and evening numbers of relatives – in some cases whole families at a time – visited the mortuary to take a look at the pallid faces which a few hours before had been radiant with happiness. This was not the first disaster to visit a film show. The earliest, and probably the most famous, was the Bazar de la Charité fire in Paris, which claimed the lives of 126 adults, while in Britain in September 1907 (just before the Barnsley event) two women and a young girl were burned to death and fifty injured after a film fire and the ensuing panic at a Gaumont film show in Newmarket. Despite the highly inflammable nitrate film stock used at that time, film fires were really quite rare, but the fear of fire led to panics that caused more deaths, while general overcrowding at venues could lead to calamities such as Barnsley. 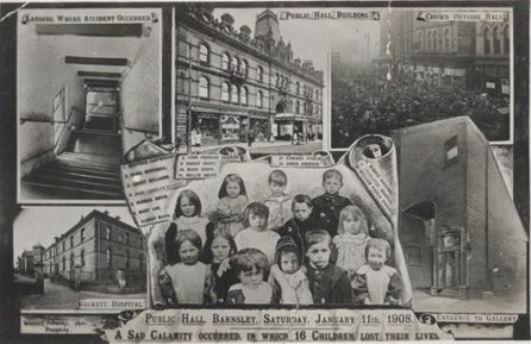 Such incidents helped provide the evidence needed for the Cinematograph Act of 1909 and the enforcement of a licensing scheme for cinemas to put an end to the ill-fitted and ill-protected venues then associated with film shows (ironically Barnsley Public Hall was a fully licensed entertainment venue with a good management reputation). The lesson from the Barnsley disaster is not so much the hazards of early film shows as the delight the children felt at going to one. It the thought of what would be on the screen, a cheaply priced entertainment designed with children in mind that was so exciting, and so revolutionary. Cinema was largely built one the pennies and tuppenies of a child audience which was offered a mass entertainment that specifically wooed them and catered for them, particularly at matinée shows when they, and not their adult supervisors, were in command. However, it took a lot of pennies and tuppenies to make a profitable show, hence the need to cram in as many as possible, and hence the tragedy. George Gresswell (1856-1931), whose sad doggerel captures the emotion of the moment, is an interesting figure. 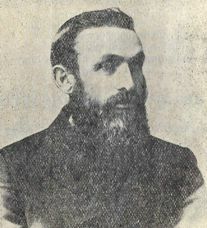 He was a railway engine driver, father of ten, Lincolnshire-born but subsequently employed at Hull, who published his own poetry from his home at 3 Dorset Street, Hull in a series of booklets, numbering twenty-six in all. These were sold locally and reportedly very popular, with a figure of 25,000 copies said to have been sold by 1912, “without the aid of agents or shops” according to the Hull Daily Mail (23 July 1912). They were particularly designed for recitation, at a time when many a local show would bring together a variety of entertainments, including recitations, and when poetry recitations were a part of home entertainments (children of the generation before mine will remember being placed before a group of smiling relatives and being forced to read out some poem committed to memory as their party piece). 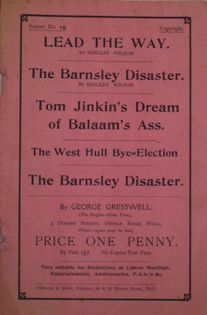 Gresswell’s poem addressed issues of railway management, religion and topical news stories, with titles such as ‘The Wreck of the Titanic’, ‘The West Hull Bye-Election’ and ‘A Railway Message from Mars’. “Mr Gresswell does not profess to be a grammarian, but he certainly can claim to be a mouthpiece of what the people are thinking and saying”, says the Hull Daily Mail, getting to the heart of things. They have a quality that connects them with calypso or some reggae lyrics, passing on the stories of the hour in a memorable and shareable form – as well as a connection with the earlier ballad tradition. There have always been such amateur poets, of whom the most notorious is another chronicler of topical disaster, William McGonagall; while perhaps the best – certainly the most successful – was W.H. Davies (he of “What is this life if, full of care/ We have no time to stand and stare”). Such poets generally published their own work for a local audience, door-to-door, in the local papers, or from home, as Gresswell did, presumably with a core group of loyal subscribers. But so much of such writing has disappeared, unofficial and hence ephemeral. There does not appear to be a single example of Gresswell’s work at the British Library. Happily several volumes are held in the University of York library, and a collected volume of his poetry, An Anthology of Rhymes, was put together in 2006 by a descendant, John G. Gresswell – appropriately enough, a self-published work. He sounds to be a good subject for a local study some day. Gresswell’s poetry booklets were priced at a penny. So were the seats to the gallery at the Barnsley Public Hall. Easy culture, priced for Everyman. Interesting article about my great grandfather. I have some of his booklets too. Thank you for your comment. It is good to know that there are copies of his booklets in several places.